On April 2, at the invitation of Alex J. Krotulski, a research scientist with the Center for Forensic Science Research and Education at the nonprofit Fredric Rieders Family Foundation, I drove 45 minutes north of Philadelphia to Willow Grove, PA, for a crash course on the impact of zero-tolerance drug policy—but from a very different vantage point than I’m accustomed to. The CFSRE is affiliated with NMS Labs, which analyzes more synthetic drugs than any other private lab in the country, accepting thousands of samples a year of both biological fluids (often from victims of fatal overdoses) and substances seized by local and federal agencies like the Department of Homeland Security. The Center’s mission is simple: to raise public awareness of the ever-evolving landscape of “New Psychoactive Substances” (NPS) that have all but replaced some organic substances, like heroin, as the dominant drugs in many markets. He showed me how he reverse-engineered an unidentified compound discovered in the blood of an overdose victim. Krotulski and his colleagues—including NMS Executive Director Barry Logan—were putting the finishing touches on a new report on “Synthetic Cannabinoids in the United States.” Knowing of my interest in these powerful and unpredictable molecules, Krotulski offered to give me an early look at the results. As I stood between two cutting-edge mass spectrometry machines the size of Volkswagens, chatting with a graduate student about her efforts to catalog hundreds of known fentanyl analogs and their numerous metabolites, Krotulski spun up one of the machines. He showed me how, in March, he reverse-engineered an unidentified compound discovered in the blood of an overdose victim to reveal a previously unknown synthetic cannabinoid, a chemical called APP-BUTINACA. This week CFSRE published the report, which covers the first quarter of 2019. Perhaps the most unexpected finding is the rapid ascendency of 5F-MDMB-PICA as the top synthetic cannabinoid in the US, based on the CFSRE data. “This marks emergence of a new top synthetic cannabinoid in the United States, overtaking the multi-year reigns of MMB-FUBINACA and 5F-ADB,” the study notes. The latter of those two chemicals, 5F-ADB, is the potent and potentially fatal compound that was responsible for poisoning hundreds of IV drug users in Philadelphia last September, when it turned up in several brands of heroin sold in the city’s Kensington neighborhood. While there are now hundreds of known synthetic cannabinoids, most non-scientists refer generically to the drugs as “K2” or “Spice”―the old brand names of two popular synthetic blends―or else by local street names like “Tookie,” “Deuce,” or “Drop,” the most common here in Philly. According to Krotulski, the newest substances represent the 10th generation of a class of drugs first developed in the 1980s by scientist John W. Huffman, who thought the chemicals—which were structurally dissimilar to organic THC, but pharmacologically mimicked its effect on humans—might have therapeutic value in a country where marijuana remains a Schedule I controlled substance. 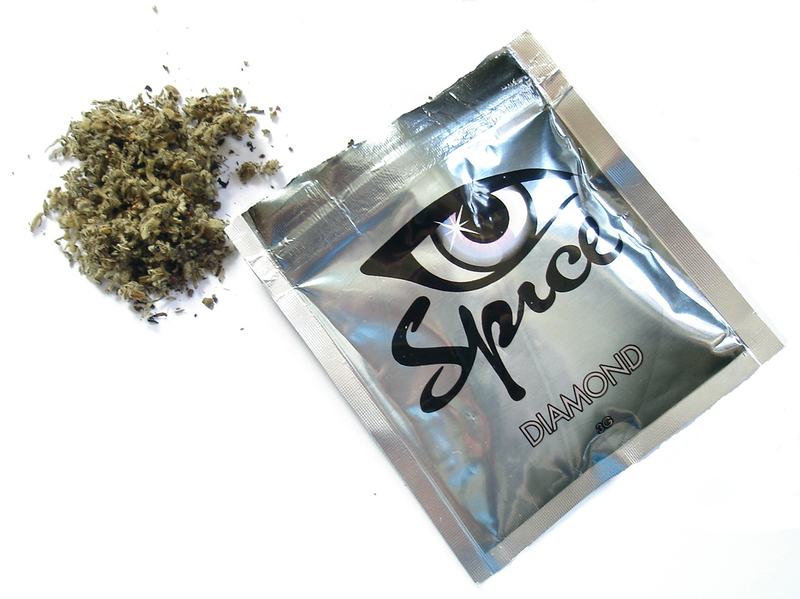 The research was ultimately abandoned; but unbeknownst to Huffman, his work would go on to provide grey-market chemists a loophole for creating the first generation of “Spice” and K2,” which began turning up in around 2008 as colorfully labeled packets marketed as “legal highs” in gas stations and smoke shops across the US. Nevertheless most synthetic cannabinoids still come from labs in China or India and are shipped to the US, where they are mixed with acetone, flavoring and inert plant material. Law enforcement officials have also told me, off the record, that they have discovered links between sales of “K2” products and the funding of terror groups in the Middle East. Roughly a dozen of those early “Spice” compounds are now classed as Schedule I drugs themselves. But with more than 250 known variations—and those numbers keep growing—it’s virtually impossible for law enforcement to blanket-ban or stop the flow of these drugs, which keep getting more powerful and more unpredictable with each molecular tweak. The unfortunate truth is that after synthetic cannabinoids first emerged as prominent recreational drugs in 2008, they rose to popularity largely among individuals who preferred organic cannabis, but were prohibited from using it. Sometimes this was due to workplace drug testing. More often, it was a result of people being drug-tested while under forms of “correctional control,” such as probation or parole—people who could find themselves behind bars for having THC in their system. Sadly, even in cities that have decriminalized marijuana, its use remains prohibited by parolees and probationers. In the early part of this decade, colorful “K2” bags covered the corners of North Philadelphia like confetti. People on probation or parole, often low-level drug dealers, revelled in smoking these substances in public view, well aware that the police or their PO had no power to stop them. Sadly, even in cities that have decriminalized marijuana possession, like Philadelphia, its use remains prohibited by parolees and probationers. This directly incentivizes their use of substances that carry less legal risk but greater health risks. In 2017, three years after marijuana was decriminalized in Philadelphia, arrests for possession were down 75 percent, according to a report from Pennsylvania’s auditor general. As of February 2018, District Attorney Larry Krasner said his office will not bring charges against those arrested for simple possession of more than one ounce. But those benefits have not trickled down to Philadelphians who are on probation, or those enrolled in medication-assisted treatment programs—where the presence of THC in one’s urine can lead to disciplinary action. Meanwhile cheap, powerful variants of K2 have never been more abundant, and are favored by many over organic weed. The good news is that efforts are underway to rectify this. Last year City Council approved hearings to discuss ending THC-testing of people on supervised release. In February, councilmembers argued that the practice is not only anachronistic in an America where 60 percent of citizens now support legalizing recreational pot, but that it reinforces racial bias in sentencing. By expanding our knowledge of so-called synthetic cannabinoids, these scientists may be playing their part in reducing punitive approaches to a far older, safer substance. Philadelphia would not be the first jurisdiction to make such a move. Washington State Department of Corrections eliminated THC from its drug-testing protocol in 2014; and this week, New York City’s Public Safety Committee unanimously approved a bill that would bar the city from testing people on probation for marijuana. “The passage of this bill would help close one trapdoor that too many people have fallen into while working to lead a better life for themselves and their families,” said NYC Public Safety Committee Chair Donovan Richards. According to Richards, 600 parolees were tested for marijuana use in New York City last year, and nearly a third were reincarcerated as a result. Krotulski and his fellow CFSRE researchers would not consider themselves advocates. But by expanding our knowledge of so-called synthetic cannabinoids, and of the dangers they can present, these scientists may be playing their part in reducing punitive approaches to a far older, safer substance.